Pasco County, Fla. (March 13, 2018) – Housing Trust Group (HTG), one of the nation’s largest developers of affordable housing, celebrated the grand opening of Park at Wellington, a $37.9 million affordable housing community 30 miles north of Tampa. Park at Wellington creates 220 affordable apartments for families and individuals earning at or below 60 percent and 40 percent of the area median income (AMI). Rents range from $367 to $827 per month and it was 100 percent leased upon opening. Public officials, community members and guests gathered this morning at the property, located at 4205 Jordana Way, Holiday, Florida, for an official ribbon-cutting ceremony and reception. During the ceremony, Matthew Rieger, President and CEO of HTG, thanked the Holiday community and Pasco County, for supporting the development. HTG broke ground on the project in July of 2016. Park at Wellington comprises 36 one-bedroom, one-bath units; 124 two-bedroom, two-bath units; and 60 three-bedroom, three-bath units ranging in size from 676 square feet to 1,379 square feet. The centerpiece of the community is a Grand Clubhouse featuring a cyber café, pool, exercise room, after-school care, laundry facility, offices and maintenance area. Residents will also enjoy the on-site playground, dog park, walking path around a central lake with fountain, and various seating and gathering areas. The community is conveniently located directly across from a Publix grocery store, an elementary school and various other residential apartment communities. The community will offer residents a supervised and structured after school program for children; weekly literacy lessons in a private space, involving both electronic and live instruction; and free employment assistance workshops addressing areas like setting job goals, interview preparation and placement. The project team for Park at Wellington includes architect Fugleberg Koch, PLLC; civil engineer High Point Engineering, Inc.; and general contractor Hennessy Construction, Inc.
HTG also celebrated today the grand opening of another affordable community in Spring Hill, Florida: Hammock Ridge. 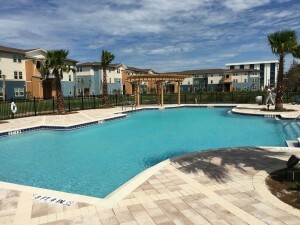 Additionally, HTG has four affordable housing communities under construction in Florida including Arbor View in Margate, Covenant Villas in Belle Glade, Douglas Gardens in Pembroke Pines, and Princeton Park in Miami.